What a day! 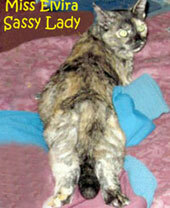 Cooped up with Daddy Kiril and Sneakers all day, due to non-stop rain, what's a sassy cat to do, I ask you? Well, there's the Carnival of the Cats to put together, so....naps be damned! Catnip in every toy and a treat in between every meal! 6 hours for napping, 6 hours for snoozing, 2 hours for tongue baths and litter box trips, 2 hours for kibble and treats, 2 hours for playtime, 2 hours for lap time, belly rubs and chin scritches, and 4 hours for blogging and other creative activity! Cats, Kittens and Carnival of the Cats! Carnival of the Cats is here again! It's Carnival of the Cats time again around the world! Cats: the critters that have inspired the human imagination for centuries! It's all about the felines, silly! Elvira Mistress of Felinity - Rejuvenating the CoTC! All Power to your imagination and creativity! Keeping cool and keeping the CoTC going! For a cat, CoTC is where it's at! Leave no interesting cat blog post unread! Change we hope you meow about! Cats and Carnival...Two "C" words you can believe in! I'm asking you to believe. Not just in my ability to bring about real change in the Carnival of the Cats. I'm asking you to believe that your regular submission and support can help that change make a difference. Cats of the world, blog! Last week I announced a major change to how the Carnival of the Cats is done and how you can participate; it ends with a link to CoTC #572 for anyone interested in seeing the first time this was put into practice. Thank you to the Wordsmith Studio Community Weekly Newspaper for sharing CoTC #571, the last carnival under the old style, with its hint that change was coming. Daddy Kiril has been a part of this community, though not as active as he'd originally hoped, since it began. Thank you to the Create With Joy blog for making our blog and CoTC #572 its Friendship Friday - Friend of the Week, last Friday. Thank you, Miss Mog, for the support as we make this change together. Thank you The Modulator and Friday Ark, for the special announcement about and plug of, CoTC #572 and your long time support of CoTC The work you have done, for almost as long as Carnival, to share the critter world with the blogosphere, has been remarkable and always fascinating. Thank you to all those who left comments and made link suggestions! 1. Over at Mind of Mog...Ritzi has been very patiently tolerating Izzy, the dog, who is visiting. Take a look at adorable photos of both. 2 and 3. 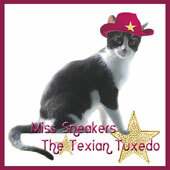 As for Sneakers and me...Woo Hoo! Daddy Kiril is 9 1/2 Cat Yrs. Old on March 5th! Also, across 2 posts we share pics of 5 of the cats in our apartment complex. 4. Over at StrangeRanger...Why is Saturday such a hard day for Maddie? A fascinating study in Sun Puddle Photography in which she is the star! 5. Over at Sparkle Cat...Summer comes up with "10 Reasons Every Office Should Have a Kitty (or Kitties)". I especially like #3. 6. Over at Life From a Cat's Perspective...Friday Sun Puddles with Samantha. 7. Over at Marian Allen's blog...Ma gets an eyeful of Munchkin & Amidala, when she comes to visit hee, hee! 8. Over at Create With Joy...What does Magellan see? 9 and 10. Over at CatSynth...An organ cat and a feline tribute to Star Trek. 11 and 12. Over at Brian's Home...The story of the rescue of Yoda & Sambo and how Brian's readers helped save the day is told in 2 parts. 13. 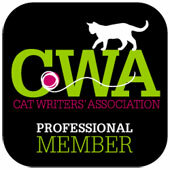 Over at Animal Shelter Volunteer Life...Concatulations for being a Blog Paws Nose-to-Nose Awards Finalist! 14 and 15. Over at Traveling Cats...This Roman kitty is sitting in front of something fascinating! Deia is a foreign artists' colony situated in the Tramuntana mountains of Mallorca...and it might have more cats than artists! 16 and 17. Over at 15 and Meowing...Sammy goes out in the snow! A Guest post about something called the Maritime Museum of Pets is a fascinating piece that has us wanting to check out the website of the museum. 18. Over at Marks Mews...A Dr. Seuss Day Poem! Dr. Seuss is 111 years old! In 2012 I took the poetry challenge, but this year too much was going on and I forgot about it! Over at Blog Paws there is huge news to report! 1. The Nose-To-Nose Pet Blogging & Social Media Award finalists have been announced! Forty-eight finalists, in 12 categories, were chosen and cats represent proudly! Nikita never knew how nominees were chosen but he always told me that, "despite our difficulties, if we worked hard and wrote our best, striving to find new ways to better our blog and develop an audience we just might someday find ourselves considered for consideration to be considered for consideration to be considered for consideration as a finalist, maybe even inspiring a new category for storytellers and poets among cat and dog blogs or critter blogs in general". Concatulations to all the finalists! Daddy has actually met a few current and previous finalists and winners at Blog Paws and elsewhere and we proudly call them friends. 2. As a member of the Blog Paws Community Pet Bloggers Influencer Group Daddy Kiril (with my help) has answered brief surveys sent his way even as he feels bad for not being able to visit the community forums for quite some time. It is something he hopes to begin to rectify. This is a fascinating set of questions and stats that shows, in a small way, how pet blogging and social media interaction has evolved since CoTC began in 2004. "When brands see this, it is also very impressive because it shows them WHERE we spend our time online and that THEY can benefit by working with pet bloggers." 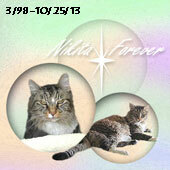 Thanks to Blog Paws for this graphic! 3. Sometimes we felines make our humans sick. Sad, but true, as much as we might wish to deny it, but did you know that human scientists are now finding new proof that "Cat genes could hold vital clues to treatments for human diseases" and disabilities such as blindness, diabetes and asthma all of which humans and moggies are susceptible? Cats have long been ignored in this type of research, but no more! This is a fascinating piece from The Guardian of England (Published since 1821!). The project will even allow researchers to trace, in detail, the origins of the house cat and I find this part very cool. Learn even more about the 99 Lives Project, here. 4. San Diego is now home to its own Cat Cafe, the first in Southern California. "The cats are courtesy of the San Diego Humane Society, and all are up for adoption". Check out the report from NBC7 in San Diego. We need one in Houston! As mentioned last week we are always looking for tips, leads, links (even search term suggestions) to interesting news stories and blog posts for the CoTC news round-up, and even for me and Sneakers to consider for the FNN Special Report, Elvira Factor, Texas Tuesday and more....and give credit where credit is due! I made the above badge from a nice photo of Magellan, with ample clear space in it, for future use and a sidebar badge they can use if they choose. (Don't know how to insert a link into the badge, but a link under it, to "Feline News Network - The Opinionated Pussycat" ( http://www.opinionatedpussycat.com ) is welcome! We have several new links to add to the list, thanks to tips from CWJ, Samantha of Life From a Cat's Perspective and the gang at Animal Shelter Volunteer Life (Hey gang, got a usable group shot? Send it to me!). 1. Friday Ark #510 - Cats, Dogs, Birds, Invertebrates, Other Vertebrates and the Extinct! Oh, my! 2. Camera-Critters #361 - The oldest active meme about photos of animals/critters! - "no photo of a cat can ever be a bad photo! But please remember, all critters (not only kitties) are welcome…horsies, woofies, chippies, squirties, piggies, buns or any other anipal. And, of course, you may include your human if they don’t mind." 8. 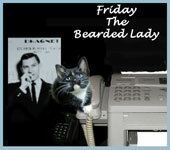 BeThere2Day hosts a Feline Friday Blog Hop - From London, this site is all about "anything and everything, fun, humour, randomness and rants and recycled jokes." NOW I can take a nap! Next week Ritzi & Mog will host and, as mentioned before, the edition may not be as full and varied as you have seen these past issues (Mog has lots to deal with, it's why she asked daddy to become co-manager! ), but your support and encouragement will be welcome! I will return for the following 3 weeks. MARCH 10 UPDATE...Thank you to Create With Joy for helping to spread the word about the new direction of Carnival of the Cats! So much info in one post! And so many hops now! There were barely any for pets just a little over a year ago when the Pet Parade started. 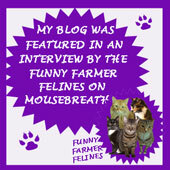 Yay pet bloggers for growing! Soon us cats will take over the whole internet! Oh Elvira, thank you very much!! I will be on the prowl looking for lots of new & neet stuff to add! This is going to be wonderful! Wow, what an information-packed blog post that was! We will do our best to be on the lookout for Carnival-worthy stuff. Thank youf or thinking of us, and thank you for being our pals! Thanks for the roundup and list of hops! Elvira you are looking adorable.